For many years Rutland was the smallest county in England, being only 152 square miles. In April 1974, owing to an appalling planning blunder on the part of the British government, it literally ceased to exist. shortly afterwards Sir Nat Kosher realized the enormous tax benefits of broadcasting from somewhere which didn't legally exist and formed Rutland Weekend Television, Britain's smallest TV station. From its very first broadcast RWTV was greeted with praise from Accountants and Taxation Experts in every walk of life. Neil Innes, ex-member of the Bonzo Dog (Doo-Dah) Band and frequent tuneful contributor to Monty Python, provided much of the musical material used in Rutland Weekend Television . There were two series of seven episodes of Rutland Weekend Television , plus a Christmas Special. The first series ran from May 12 to June 16, 1975, and the second series ran from November 12 to December 24, 1976. The Christmas Special aired on December 26, 1975. For complete information, please see Garrett Gilchrist's highly informative Episode guide to Rutland Weekend Television . 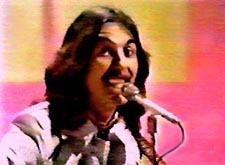 George Harrison was a musical guest on the Christmas show, providing the first Rutland/Beatles connection. He is seen here performing "The Pirate Song" (a George Harrison/Eric Idle composition) as the end credits for the Christmas show begin to roll.